Download your 2019 Free Carnival Guidee right from here. 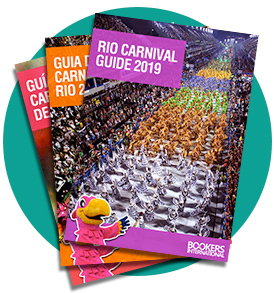 Our Carnival guide is a must-have 50 page PDF document to read before and during Rio Carnival. Here you will find useful information about the venues, an agenda of all events, including those hidden secrets ones only cariocas know about, and more than a hundred insights and tips from our Carnival experts. You will also learn all about the Samba Parades, and how to make your way to the Sambadrome and other popular gatherings in Rio Carnival. Included in the guide are schedules of the street bands and Carnival Balls held throughout the city. Our guide has been exclusively designed to help you enjoy your stay in Rio. For that, we have included advice and recommendations from experts on the Carnival.